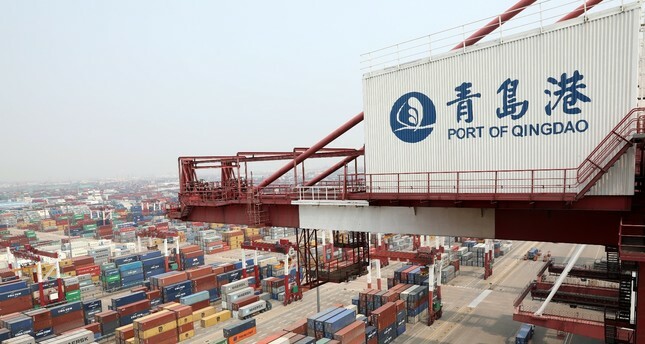 A view Qingdao port located in China's Shandong province. With a March 1 deadline fast approaching, U.S. and Chinese officials are scheduled to resume negotiations today to prevent escalation of a trade dispute that has major implications for the global economy. China's economy already has shown signs of slowing, while the trade war has shaken the confidence of U.S. businesses, as retaliatory tariffs have raised prices and helped choke off a key export market. And U.S. President Donald Trump's aggressive strategy has failed to produce a reduction in the U.S. trade deficit with China, which he set as a primary goal. U.S. Trade Representative Robert Lighthizer and Treasury Secretary Steven Mnuchin will lead the U.S. delegation for the third round of talks on Thursday and Friday in Beijing. Trump said Thursday he did not expect to meet his Chinese counterpart Xi Jinping before the deadline for the two economic superpowers to reach a deal. Trump had said final resolution of the trade dispute would depend on meeting with Xi "in the near future" but told reporters it had not yet been arranged. Although top White House economist Larry Kudlow said Thursday that while Trump was "optimistic" about prospects for a deal, there remained a "sizable distance" separating the two sides. While China has offered to buy more U.S. soybeans and beef, officials have yet even to agree on a draft of a deal that would address key U.S. concerns, according to media reports. The dispute has escalated to encompass $360 billion in trade between the two economic superpowers, and without an agreement by the start of March, the Trump administration is poised to more than double punitive duties on $200 billion in Chinese goods. "Right now it is in place but that is right now," the official told CNBC. "It could change via telephone." The White House said there would be a preparatory meeting of senior officials beginning Feb. 11 and the talks would include officials from the Agriculture, Energy and Commerce Departments. The main delegation also includes David Malpass, whom President Donald Trump has nominated to be president of the World Bank and who has worked to limit the bank's assistance to Beijing. However, strident White House China critic Peter Navarro was not listed as part of the U.S. team.